The E’ Coy, 13 NAP (IR) Bn. Outpost is located along the Assam Nagaland border some few kilometres away from Yanglok village in Longleng district. The major problems faced by the camp was lack of electricity as it was not connected to the grid, and also there was no shops in the vicinity of the camp to cater to the basic needs of the jawans to replenish items such as candles, kerosene, diesel, torch batteries etc. Though a diesel generator was provided to generate electricity, it ran for two hours every night so as to conserve fuel and avoid mechanical failure. Lack of electricity hampered their means of communication like mobile phones, wireless handsets and use of search lights. Also taking serious note on the importance of communication to send, relay and receive signal messages and to keep in constant touch with their higher ups, they were compelled to go to the nearby villages to charge their batteries. 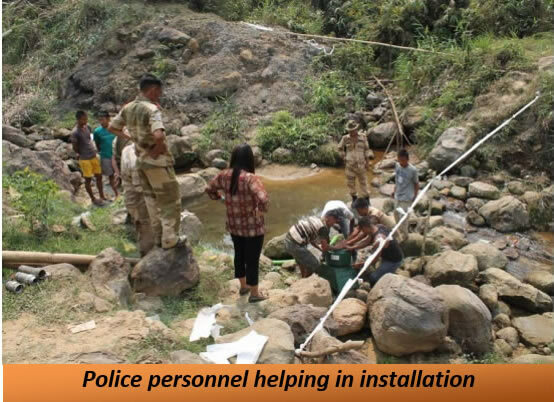 The installation of a 3Kw hydroger was undertaken in 13th to 15th March 2014, with the active participation of the Officers and jawans of the outpost. Training on operation and maintenance of the machine was given in-situ. Also awareness on conservation of the biodiversity was imparted to them. 4. More knowledgeable on the conservation of the Biodiversity.